(Nanowerk News) Scientists at the U.S. Department of Energy’s Argonne National Laboratory have identified a new class of silver-based catalysts for the production of the industrially useful chemical propylene oxide that is both environmentally friendly and less expensive. “The production of propylene oxide has a significant amount of by-products that are harmful to the environment, including chlorinated or peroxycarboxylic waste,” said chemist Stefan Vajda of Argonne’s Materials Science Division and Center for Nanoscale Materials. “We have identified nanoclusters of silver as a catalyst that produce this chemical with few by-products at low temperatures.” Propylene oxide is commonly used in the creation of plastics and propylene glycols for paints, household detergents and automotive brake fluids. “Propylene oxide is a building block in the creation of several other industrially relevant chemicals, but the current methods of creating it are not efficient,” Curtiss said. “This is basically a holy grail reaction,” remarked Greeley. 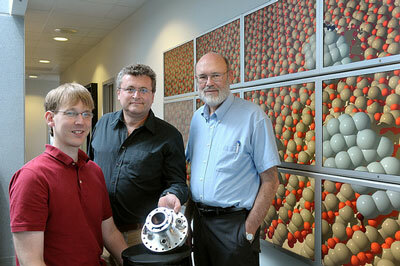 “The work opens a new chapter in the field of silver as a catalyst for propene epoxidation,” added Curtiss. Funding for this project was from the U.S. Department of Energy Office of Science and from the U.S. Air Force Office of Scientific Research. A paper on this work will be published in the April 9 issue of the journal Science. The U.S. Department of Energy's Argonne National Laboratory seeks solutions to pressing national problems in science and technology. The nation’s first national laboratory, Argonne conducts leading-edge basic and applied scientific research in virtually every scientific discipline. Argonne researchers work closely with researchers from hundreds of companies, universities, and federal, state and municipal agencies to help them solve their specific problems, advance America’s scientific leadership and prepare the nation for a better future.